Trending at $6.93eBay determines this price through a machine learned model of the product's sale prices within the last 90 days. Hartz Ultraguard Flea & Tick Collar for Cats and Kittens kills fleas and tick for up to 7 months.This unique collar not only breaks the flea life cycle but also focuses the pesticide towards your pet and away from you. Keep cats and kittens free of ticks and fleas with these collars. For use on kittens 12 weeks of age and older. Reflects light up to 300 feet. About the product. 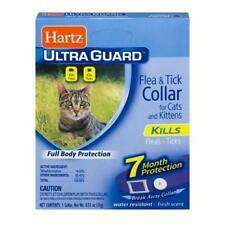 Hartz® UltraGuard™ Flea & Tick Collar for Cats and Kittens kills both fleas and ticks for 7 months. For continuous flea and tick protection under normal conditions replace the collar every 7 months. Hartz UltraGuard Water Resistant Plus Flea & Tick Collar for Cats and Kittens - 7 Month Protection. Kills and prevents flea eggs up to 7 months. Only for cats and kittens 12 weeks and older. This collar kills and repels both fleas and ticks for 7 months and also prevents flea eggs from hatching for over half the year - stopping the flea life cycle and inhibiting reinfestation. The water resistant design remains effective even after getting caught in the rain. Buy in bulk and save! High Quality. Total of 6 units. Hartz® Ultra Guard Plus® Flea & Tick Collar for Cats and Kittens. Water resistant. Fresh scent. Kills: Fleas. Prevents: Flea eggs from hatching. 7 months protection. White collar. Break-away collar. What you see in the pictures is what you receive. Hartz® UltraGuard™ Flea & Tick Collars for Cats and Kittens kills both fleas and ticks for 7 months. For continuous flea and tick protection under normal conditions replace the collar every 7 months. 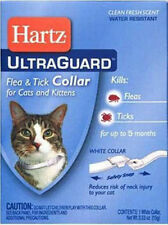 Hartz UltraGuard Flea & Tick Collar for Cats and Kittens kills both fleas and ticks for 7 months. This collar has a clean, fresh scent and is water resistant. For use on kittens 12 weeks of age and older. For use on adult cats and kittens 12 weeks of age and older. Kills and repels fleas and ticks for 7 months. Can be worn simultaneously with your cat's regular collar. Features a breakaway, safety release snap. This flea and tick collar kills and repels fleas and ticks for 7 months! For use on adult cats and kittens 12 weeks of age and older. Can be worn simultaneously with your cat's regular collar. Features a breakaway, safety release snap. This collar kills and repels both fleas and ticks for up to 7 monthsIt also kills and prevents flea eggs for up to 7 months thereby stopping the flea life cycle and preventing re-infestationThis collar is designed for use on. 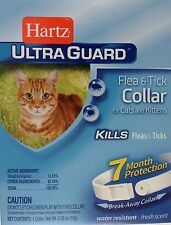 Hartz UltraGuard Plus Flea & Tick Collar 7 Month for cats and kittens FREE SHIP . Condition is New. Shipped with USPS First Class Package. Includes 1 collar. We are honest people and will work to correct any mistakes. The original boxes maybe a bit beat up. HARTZ - Ultra Guard Reflecting Flea & Tick Collar for Cats and Kittens White - 1 Collar. Hartz UltraGuard Flea & Tick Collar for Cats and Kittens. USE ONLY ON CATS. kills both fleas and ticks for 7 months. Do not use on kittens less than 12 weeks old. Probably not. To ensure that all of our orders go out as soon as possible we use an automated system. We don't know automatically. Occasionally orders may take longer. 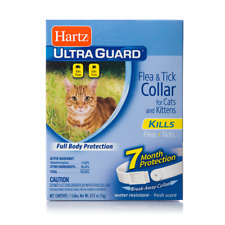 Hartz Ultra Guard Plus Flea Tick Collar for Cats Kittens is an easy and effective way to keep pests off of your pet. The collar is water resistant and both kills fleas and ticks and prevents flea eggs from hatching, thus ending the flea life cycle. There is no expiration date on the box. Hartz UltraGuard. Hartz UltraGuard Flea and Tick Collar for Cats and Kittens kills both fleas and ticks for 7 months. This collar has a clean, fresh scent and is water resistant. For use on kittens 12 weeks of age and older. 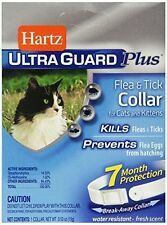 Hartz Ultraguard Flea and Tick Collar for Cats & Kittens Neck White 7 Months. For Cats and Kittens. Break-Away Collar. 7 month Protection for killing fleas and ticks on your pet. Color White. Hartz Ultra Guard Plus Flea & Tick Collar. Hartz UltraGuard Flea & Tick Collar is perfect for cats of all breeds and sizes, and it is safe for cats 12 weeks and older. This collar will keep your cat protected for seven months. Hartz UltraGuard Plus Water Resistant Breakaway Flea & Tick Collar for Cats. Condition is New. Shipped with USPS First Class Package. New in box (NIB). Hartz Ultra Guard flea and tick collar for cats and kittens. 7 month protection with break away collar. Water resistant, fresh scent. Buy in bulk and save! Total of 6 units. High Quality. Brought to you by Hartz. You will receive one collar good for dogs with necks up to 21". For use on kittens 12 weeks of age and older. About the product. Kills and repels both fleas and ticks for up to 7 months, PLUS it kills and prevents flea eggs for up to 7 months, thereby stopping the flea life cycle and preventing re-infestation. Safety release snap reduces the risk of neck injury to cat. Water-resistant. For use on kittens 12 weeks of age and older. White. No. 94268: For Use With: Cats & Kittens 12 Weeks Older, Water Resistant: Yes, Duration: 7 Months, Reflective: No, Pkg Qty: 1, Package Type: Box Prop. 65 Warning for California Residents: This product may contain chemicals known to the State of California to cause cancer, birth defects, or other reproductive harm. 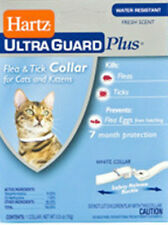 Hartz UltraGuard Plus Water Resistant 7 Month Protection Breakaway Flea & Tick Collar for Cats. This collar kills and repels both fleas and ticks for 7 months and also prevents flea eggs from hatching for over half the year - stopping the flea life cycle and inhibiting reinfestation. Kill fleas, flea eggs and ticks. Once you are satisfy with my products and services. Would be highly appreciated. Hartz Ultraguard Flea & Tick Collars for Dogs and Cats. This collar kills and repels both fleas and ticks for 7 months and also prevents flea eggs from hatching for over half the year - stopping the flea life cycle and inhibiting reinfestation.